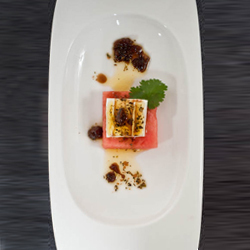 A stunning presentation, this Chile-Roasted Feta and Watermelon Slab is as imaginative and exotic as a modern vegetarian dish should be. 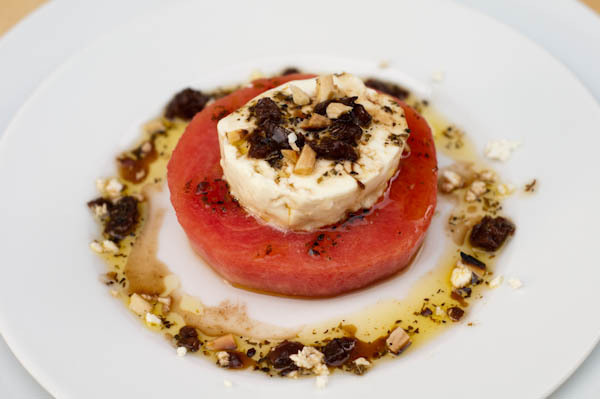 Sweet watermelon, paired with salty warm feta, drizzled with bold oregano dressing; this appetizer presents a bouquet of unexpected flavors and inspires me to search for other adventurous vegetarian dishes. Soak the raisins in hot water for about 20 minutes until plump, then drain and finely chop. Crush the garlic with the salt (in a mortar and pestle, if you have one) and transfer to a bowl. Add the remaining ingredients, along with the raisings, and whisk together. Cut a large piece of foil and put it on a baking sheet. 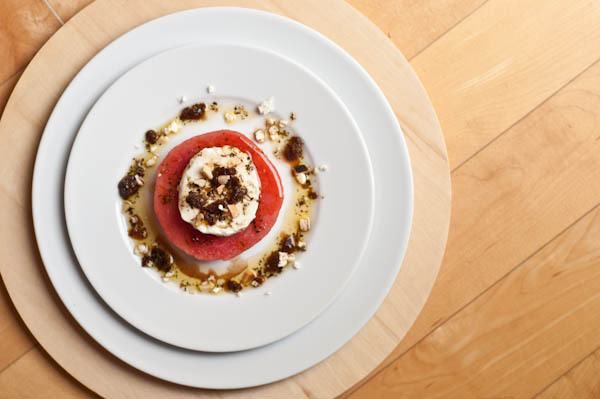 Place each piece of feta on top, drizzle each piece with olive oil and sprinkle with a few chile flakes. Put another piece of foil on top and fold the foil edges together to form a loose parcel. (You can season and wrap the feta in advance but if you take it straight from the fridge you will need to double the cooking time.) Place in the oven and bake for 8 minutes, by which time the feta will be soft and warm. Remove from the oven and assemble immediately: Snip the cilantro and shiso sprouts and mix with the baby lettuce leaves and pine almonds. 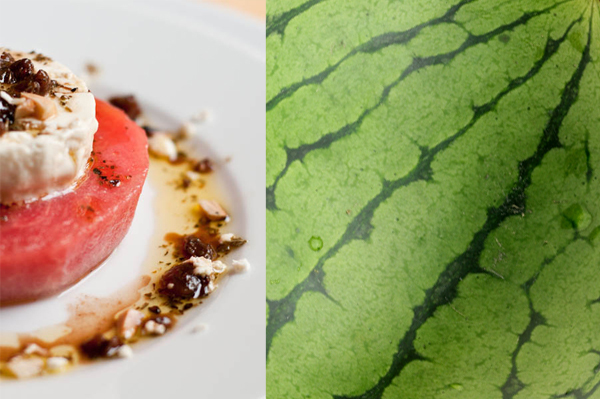 Dress with a little of the Raising and Oregano Dressing and pile neatly on top of the chilled watermelon slabs. Open the foil parcel and place the roasted feta on top of the salad. Drizzle with olive oil and serve immediately. A crisp fruity Veuve Clicquot Brut Yellow Label Champagne is a perfect match! I can’t agree more with you about tofu. Never tried it in my life and don’t think I ever will. Love the combination of all the ingredients in your dish. Ivy, I actually like tofu but I’d rather see vegetables and fruits as the main ingredients in the vegetarian dishes! Hi! This recipe looks fantastic.. I’m definitely going to be trying it soon. Is there a brand of feta cheese that you prefer when you make this? Raj, I don’t remember the brand, however, I would recommend going to Whole Foods and getting their best-selling brand. When it comes to cheese – the quality makes all the difference! This looks like it came from a restaurant. Beautiful dish and photography.